A decade ago, Jim Ray brought together a champion martial artist, a former Navy Seal and a police-weapons specialist to draft designs for what he hoped would be the perfect pocketknife. A Buck keyring tactical knife includes a one-hand opening blade and bottle opener. Mr. Ray was a pioneer in a technological revolution that has transformed “tactical” knives — originally used in military combat — into a $1-billion-a-year consumer business, aimed at just about anyone in the market for a small knife. These 21st century pocketknives, with their curved, perforated or serrated blades and ergonomic grips, can inflict deadly damage, but they are also compact, easily concealed and virtually unregulated. In March, a monthly FBI bulletin alerted law-enforcement agents nationwide to “the emerging threats” posed by the knives. Though there are no statistics on how many crimes have involved tactical-style knives, the FBI says knife-related crimes have edged up, to 15.5 percent in 2004 from 15 percent in 2000. In that time, violent crime in general dropped 4.1 percent. The knives’ popularity has been a boon to some retailers. Mike Janes, owner of Second Amendment Sports, a hunting, fishing and camping superstore in Bakersfield, Calif., says that knife sales have been climbing an average of 25 percent a year in the past decade and that 75 percent of the pocketknives he sells are tactical. “Are you tacti-cool? That’s what we say down here,” Mr. Janes says. Dave Vanderhoff, who runs U.S. Martial Arts in Clifford, N.J., recently taught a knife-fighting class that included a judge, a banker, a nurse, a young woman with a belly ring and a French chef from Manhattan. And Spyderco Inc., for example, makes a tactical knife that, when folded, masquerades as a credit card. But the marketing techniques for some of the new pocketknives aren’t so mainstream. Cold Steel Inc. makes the 3/4-ounce “Urban Pal,” which has a 1.5-inch blade. “The Urban Pal should be standard equipment for survival in today’s urban jungle,” its Web site says. Modern tactical knives are rooted in the 1980s, when some martial artists in the U.S. became practitioners of a Filipino style of knife-fighting. An early innovator was Ernest R. Emerson, a martial artist and custom knife builder. In 1995, Oregon’s Benchmade Knife Co. collaborated with Mr. Emerson to mass produce the Closed Quarters Combat 7 knife. It opened quickly, locked in place and could be closed with one hand. Mr. Emerson, 51 years old, says he insisted on selling that knife for $159, believing the high price, performance and custom look would give it cachet. The knife was a hit, and competition got hot. Mr. Emerson formed his own company in 1997 and says annual sales rose to about $10 million last year from $800,000 at the start. Worried that they might face regulatory scrutiny, makers of the new-style pocketknives formed the American Knife and Tool Institute. The trade group credits U.S. Sen. Ron Wyden, an Oregon Democrat, with persuading U.S. Customs in 2001 to stop seizing shipments of one-hand-opening tactical knives that some investigators considered switchblades. A spokesman for Sen. Wyden, Andrew Blotky, says he can’t confirm the senator’s involvement. Soon the upstarts who dominated the self-defense market were jolting the traditional knife industry. 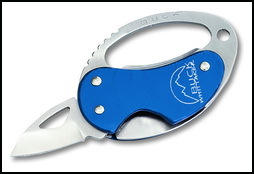 Buck Knife Co., a staple among sportsmen; W.R. Case & Sons Cutlery, famed for its collectible pen knives; and Leatherman Tool Group Inc., which makes pocket-sized tool kits, have all introduced tactical knives since 2003. “It’s a testosterone thing,” says Buck’s chairman, Charles “Chuck” Buck, 75 years old, who estimates the retail market for tactical knives at $1 billion. Leatherman Tool Group jumped on the tactical-knife bandwagon in 2005, introducing a full line of tactical-type knives. The most prominent feature on its knives is the “Blade Launcher” mechanism, which lets the user flip a menacing-looking blade out of its handle with lightning speed. Yet it also has a bottle-cap opener, a nod to Leatherman’s heritage. But Tom Arrowsmith, chief executive of W.R. Case, accuses competitors of “weaponizing” the pocketknife and says it’s an approach his company won’t take. He does concede, though, that customer demand has prompted his company, a 117-year-old maker of pretty penknives, to offer a line of one-hand-opening knives with tactical features. The blades on most of the new pocketknives are less than four inches long, the maximum length that passengers were permitted to carry onto U.S. airlines before the Sept. 11, 2001, terrorist attacks. In 2004, the National Commission on Terrorist Attacks concluded that the hijackers in those attacks used short knives — not box cutters — to seize control of the planes. At the Pennsylvania crash site, 14 badly damaged knife parts were collected, and at least half have tactical-knife characteristics. But the FBI cautions that it can’t be sure those parts are from knives that belonged to the hijackers. Technology has made blade length almost irrelevant. The city of Atlanta prohibits people from carrying pocketknives in public with blades longer than two inches. Yet, in a widely publicized case, ex-Marine Thomas Autry used a two-inch blade in May to kill one mugger and wound another when he was confronted by five assailants armed with a shotgun and a .38-caliber pistol. “Clearly we are seeing wounds you would expect from a bigger blade from what victims say was a small knife,” says Andrew Ulrich, a Boston Medical Center emergency-room doctor. Nicholas Nobella, 25, took a four-hour class at the Bakersfield shop. Several months later, he admitted to police that he stuck his tactical knife into stripper Edward Pedrosa, 24, during a melee that broke out when men attending a bachelor party raided a bawdy bash for the bride-to-be, says Kern County, Calif., Deputy District Attorney Matt Magner. Mr. Pedrosa died. Mr. Nobella’s lawyer says his client was acting in self-defense. Mr. Janes says Mr. Nobella isn’t typical of the students at his knife classes. Meanwhile, in the race for the next big thing, some companies are competing to make more durable ceramic and plastic knives that can pass through metal detectors. Plastic “assisted-opening” knives that flick open with a slight nudge of the blade can be purchased on eBay for $20. Cold Steel sales director Rick Valdez describes the company’s $15 “Night Shade” plastic knives as “letter openers.” Nonetheless, the company’s Web site has a film clip of men attacking slabs of meat and decapitating plywood people, and it notes that the knives can be “taped just about anywhere” on the body.